Just when things couldn’t get worse for your local telephone company, there’s even more competition to win your business. They’ve been beaten down by cell phone companies, the local cable company has phone services, there’s calling from Skype and other VOIP services, and now even your humble GMail account is a threat to your old-fashioned land line phone. 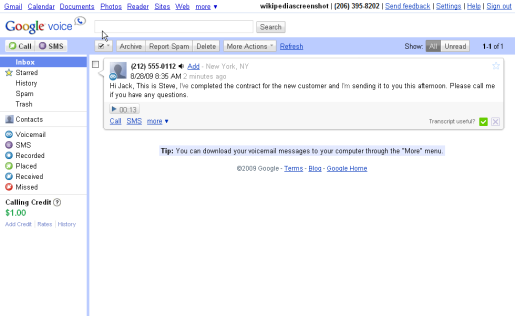 Google has launched Google Voice, a vocal communication service that piggybacks onto your GMail account. “We’re helping you organize your communications,” said Google Voice’s product manager, Vincent Paquet. “It’s just an easy way for people to stay in touch with their friends and family and community.” Speaking of organizing communications, if you want to try out Google Voice, then feel free. Literally free, as Google Voice phone calls are free, provided you’re calling the US or Canada. International calls will cost money, but apparently the price is even lower than Skype’s rate of pennies per minute. Google is confident they’ll make enough money on international phone calls to pay for the free US calling. The product is based off of the technology that used to power GrandCentral, which Google bought and integrated into their technology fold in 2005, with some additional features like transcription of voice mail messages and integrated GMail/voice mail.